Hey All! Its Katie here. I had to stop by and weigh in on a alittle project that literally took the breath right out of me. I am 3 years into the amazing campaign and now non-profit “Changing the Face of Beauty”. Three years into working with amazing brands who continue to surprise me with awesome ideas for change within their own advertising. This message continues to grow through companies that believe. When I say believe I mean really believe. We work hard to provide our “Proud Participating Companies” with ideas to stimulate change within their brand. We remind them to put people with disabilities on the check list as they plan their future ad campaigns but the beautiful progression and message of inclusion comes from within each of them. They are the ones who creatively take what we have taught them here at “Changing the Face of Beauty” and make it their own. This week it happened again. I received the sweetest note from our “Proud Participating Company” Matilda Jane Clothing. It came in the form of an email, happily explaining that they had just launched a new line called, “Friends Forever” and because the mission, “inclusion of all kids of all abilities” matters so much to them, they made sure that all the little girls wearing their clothing knew that too. We recently launched our new Fall Collection, Friends Forever. With this new release we have worked with one of our fabulous Trunk Keepers to create MJC paper dolls. We have included beauties of all kinds with our paper dolls and wanted to get some sent your way as they support your mission. Where would be the best place to send these? We hope you will enjoy, they are pretty cute. 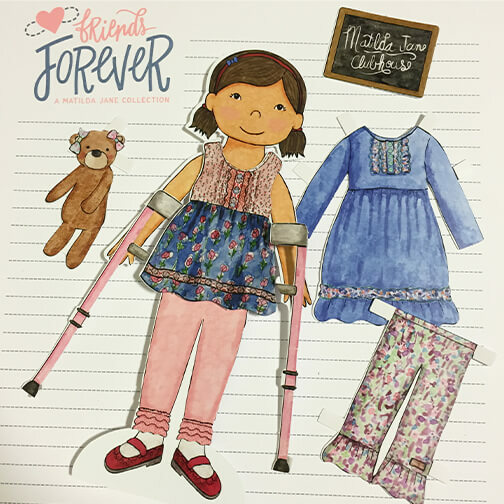 Keeping up with our mission is as simple as adding a pair of crutches to the paper doll sheet. It is THAT simple. Once they are added Matilda Jane Clothing is letting the disability community know that they matter. That they actually see those sweet little girls who are rocking an extra chromosome, keeping up in a wheelchair or using crutches for a little extra support. You see I get emails all the time asking that we advocate for this difference or that difference and I remind our “believers” that it is absolutely not about what makes us different and everything about what makes us the same. So I don’t dictate to the companies we work with who they should represent. I ask them to remember one of the largest minorities in the world, those who are living with a disability and look what they do? They do something this amazing. They stop and think before they grab their colored pencils and decide exactly how they are going to make sure that those little girls who are living with a difference feel the love that all the other children feel every day in advertising. Matilda Jane Clothing reminded me that creativity speaks so much louder then words. It is their personal way to connect with their consumers in the same way that their clothing designs do. Inclusion in your brand is so very simple. It requires just a little extra creativity, thats all. I promise the benefits are so much greater then any effort you as a brand will have to put in. Caring and seeing your consumers matter. Advertising being the loudest voice in the world has the ability to change the perceptions of people everywhere. I have so much satisfaction knowing that as boxes of Matilda Jane Clothing will travel to their owners and these sweet little paper dolls will travel with them. Girls all over the world will open their boxes to see the beautiful designs created especially for them and with those designs will be a beautiful sheet of paper dolls that represent all of them. Some girls will understand what those crutches do and some will not. But you know what? They will open doors for opportunity. Opportunity to play with a doll that is similar to themselves and opportunity to ask their Moms or Dads what these crutches are used for. Exposure and conversation cultivate opportunity for change. One sheet of beautiful paper dolls will open minds, educate our future and change the world. We are so proud to be a part of that change. Do you know of a brand who wants to change the world with us? Ask them to get in touch with us! Lets ensure the landscape of advertising is changed forever.